Screen sizes range from 32 inches to 63 inches. Larger plasmas, like a 103 inch unit from Panasonic, are in production, but are still prohibitively expensive for consumer use. Sizes range from 13 inches to 45 inches. As with plasma, there are larger LCD TVs made, like a 100 inch display recently released by LG, but they are not readily available or affordable at the consumer level. Plasma TVs are the current size champions, particularly when comparing TVs that consumers can easily purchase. LCDs are catching up in size with their developing technology, however, and may surpass Plasmas in the near future. This may be due to difficulties in producing glass large enough for larger plasmas. LCD TVs have the advantage here, but by a small margin. Your viewing experience is not going to be ideal at 160 or 175 degree angles. LCD TVs used to have a problem in this area, primarily because LCDs were originally used as single person computer monitors. Plasma displays refresh and handle rapid movements in video about as well as CRT televisions. LCD TVs were originally designed for data display, and not video. Therefore refresh rates had to be improved. LCD TVs with refresh rates below 16 ms or lower (5-15 ms) show very few noticeable artifacts. LCD TVs are now available with refresh rates as low as 5ms. Slight edge to plasma technology. Plasma TVs can suffer from burn-in produced by static images. After extended periods, stationary images "burn in" and produce an after-image ghost which remains permanently on the screen. With technologies such as 'pixel orbitor,' new plasma TVs have addressed burn-in and significantly reduced the issues of older models. With the latest plasma technology, this is less of an issue than ever before. "Pixel orbitor," for example, is one method of reducing burn in used by plasma manufacturers. It requires no additional programing from the end user as some older burn-in prevention techniques did. If you plan to use a plasma for gaming, some games with permanent 'dashboards' may still cause some burn-in. Check user-manuals for available solutions by model. Plasma TVs have a reported half life of 30,000 to 60,000 hours. Half-life is the time it takes the lamp to fade to half its original brightness. LCD TVs also have replaceable backlights, but the expense of replacing one when the time comes may be greater than simply replacing the entire TV. Plasma displays are fairly heavy, and may need additional supports to be mounted onto a wall. LCD TVs weigh less than comparably sized plasma TVs. LCD TVs are considerably lighter, more portable, and cheaper to ship. Plasmas are very fragile making them tricky to ship and install. Unlike the commercials where plasmas are mounted on the ceiling, plasmas are best installed by a professional, and should be installed on a wall that can bear a good deal of weight. Much more durable than plasmas. End users can easily mount an LCD TV themselves if desired. LCD TVs are far less fragile than plasmas. Due to their fragile nature, plasma TVs need to be shipped by specialty carriers. Overnight or fast delivery options are not recommended. Special shipping methods and their heavier weight add to higher shipping costs. Shipping LCD TVs is not difficult, and is not as expensive as shipping plasma displays. LCD TVs are lighter and far less fragile than plasma displays making shipping easier and less expensive. Plasmas are heavier, use more power, and run hotter than LCD TVs, and therefore require more planning when mounting them. Plasmas are generally best installed by professionals. End users can easily install LCD TVs themselves, or can use them just as they use a traditional TV using a stand. LCD TVs are much easier to install than plasma TVs. Plasma TVs report higher brightness and contrast levels than LCDs. Under ideal conditions (no ambient light) this is a true advantage of plasma technology, because LCD TVs are backlit and therefore light must be blocked to create blacks. Plasmas have individual pixels that either on or off, creating deeper blacks and better contrast. LCD TVs can often look better in 'real-world' situations. Plasmas are made with a special glass surface that can reflect light, which dulls the brightness and contrast of the image. LCD TVs reflect very little light, allowing them to maintain levels in well-lit rooms. Both LCD and plasma TVs will meet the brightness expectations of most consumers. However, in 'real world' situations with ambient light, LCD TVs will generally look a little brighter. As thin as 3 inches deep. As thin as 2 inches deep. LCDs TVs are just a bit thinner. High altitudes can affect the performance of plasma displays because the gas held inside each pixel is stressed, and has to work harder to perform. Some manufacturers make plasmas that are specifically designed for high-altitudes, but they may be priced higher than standard models. LCD TVs are not affected by high altitudes. Plasma is a flat, lightweight surface covered with millions of tiny glass bubbles. Each bubble contains a gas-like substance, the plasma, and has a phosphor coating. Think of the bubbles as the pixels. Now, think of each pixel-bubble as having three sub-pixels - one red, one green, one blue. When it is time to display an image signal (RGB or video), a digitally controlled electric current flows through the flat screen, causing the plasma inside designated bubbles to give off ultraviolet rays. This light in turn causes the phosphor coatings to glow the appropriate color. Millions of RGB bubbles glow and dim to make a rich, vivid image on your plasma TV. What Is LCD Technology? 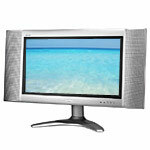 Like popular LCD monitors you commonly see used with computers, LCD TVs have a slim design and a flat viewing surface, but have been fine tuned for video display. Recent advances in flat panel LCD technology now allow for larger screens, wider viewing angles, and higher-quality video images. LCD TVs are also competition for trendy-but-heavy, plasma display technology. They are several times lighter than comparably sized plasmas, and are far more durable. How do LCD TV's work? Two sheets of polarized transparent material, one with a special polymer coating that holds liquid crystals, are adhered together. Electric current is passed through individual crystals, which interpret the information from the broadcast signal to allow or disallow light through them to create an image. The crystals themselves do not produce light, so the technology is "non-emissive" and therefore does not give off radiation like an older television does. Fluorescent tubes housed behind the transparent material illuminate the image. They require less power to operate than CRT and plasma televisions which require powering hundreds of electrodes to stimulate the phosphorous. Use non-emissive technology; do not emit radiation. Use fluorescent tubes which require less power to operate.